William: "Barrett, what is your favorite part of your picture?" Barrett: "The building all covered up!" 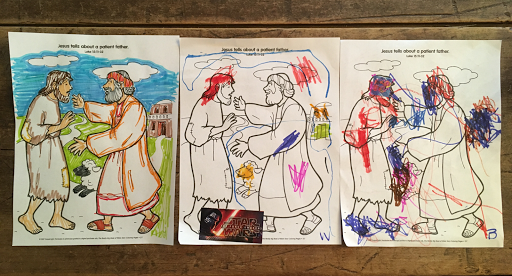 Barrett put his sticker right over Jesus's face and then colored on top of the sticker, as he always does. William's favorite part of his picture was the building on fire with the water spraying it, as well as the golden lamb. "I know lambs are white, but I want to make this one gold."